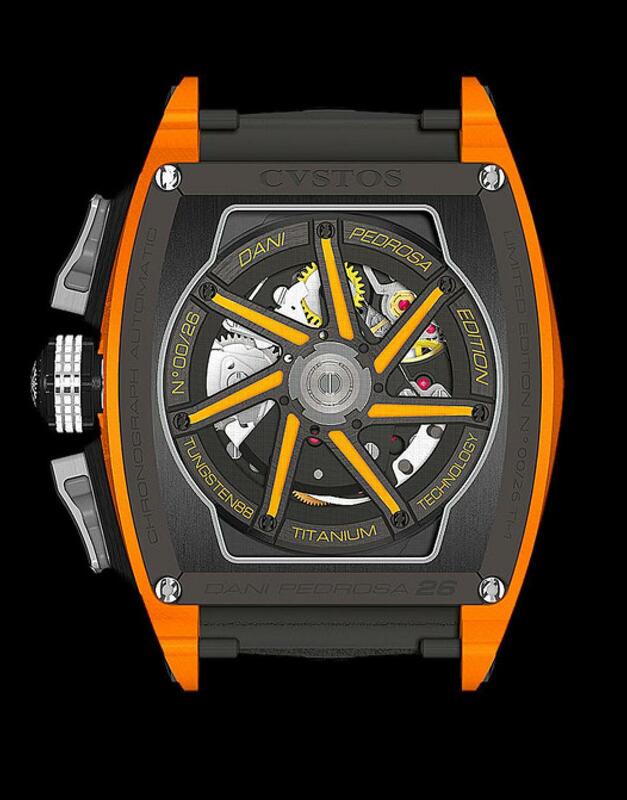 Merging the respective worlds of World Moto GP vice champion Dani Pedrosa and CVSTOS head watch designer Antonio Terranova, the talented duo have designed an ultra-lightweight technical timepiece inspired by the thrilling, fast-paced world of motor-racing. A vision of style and technicality, the Challenge Dani Pedrosa was developed to technical criteria from the world of motor sports. CVSTOS has recently announced new partnership with Spanish MotoGPmotorcycle racer Dani Pedrosa. 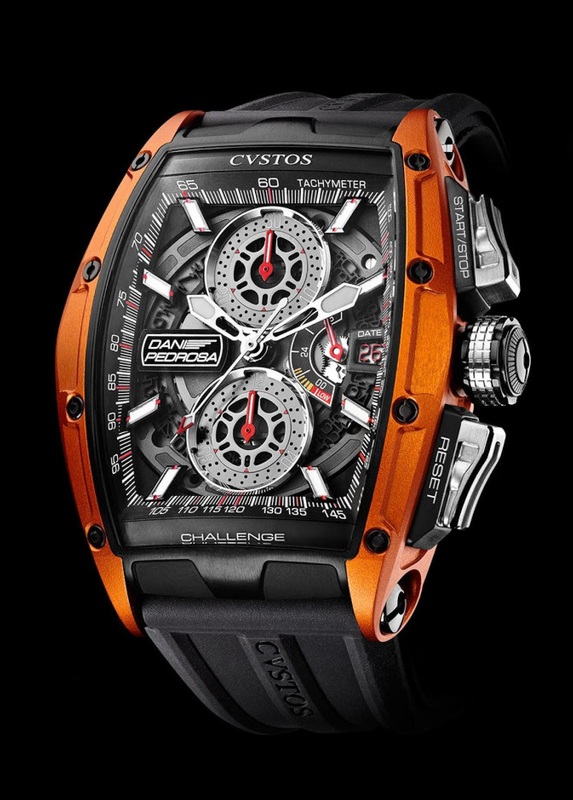 To celebrate this association CVSTOS introduces the CHALLENGE DANI PEDROSA LIMITED EDITION, co-created with Dani Pedrosa himself. Having mounted his first bike aged four, Dani Pedrosa is now a triple world champion across many classes, who rides for Repsol Honda – the factory Honda team, the world’s leading bike manufacturers. In 2012 Dani won seven out of 18 Grand Prix; he has taken the podium 16 times out of 18 races. Currently MotoGP vice champion, Dani is certainly a favourite for the 2013 Grand Prix season, which commenced in April 2013. As Dani’s lucky number is 26, the Challenger is produced in two limited series of 26 models each, in ‘Honda Repsol’ orange aluminium, or a smart dove grey all-titanium version. Two vents appear on the left-hand side of the case, adding dynamism to the design and recalling the air intakes on a motorbike. Other biking elements appear on the watch as a tribute to Dani’s prowess and the thrilling world of motor racing: the crown shows an elegant interpretation of a motorbike flywheel, and two sturdy grip-style push buttons echo the bike throttle and brake handlebars. The barrel-shaped watchcase, with the number 26 engraved on the side, encloses a dial with sub-dials in the form of brake discs, and a power reserve in the style of a fuel gauge. The Dani Pedrosa logo is etched onto a plate at 9 o’clock. An extra flourish is seen in the number 26 highlighted in red, displayed on the 26th of each month, within the date counter. 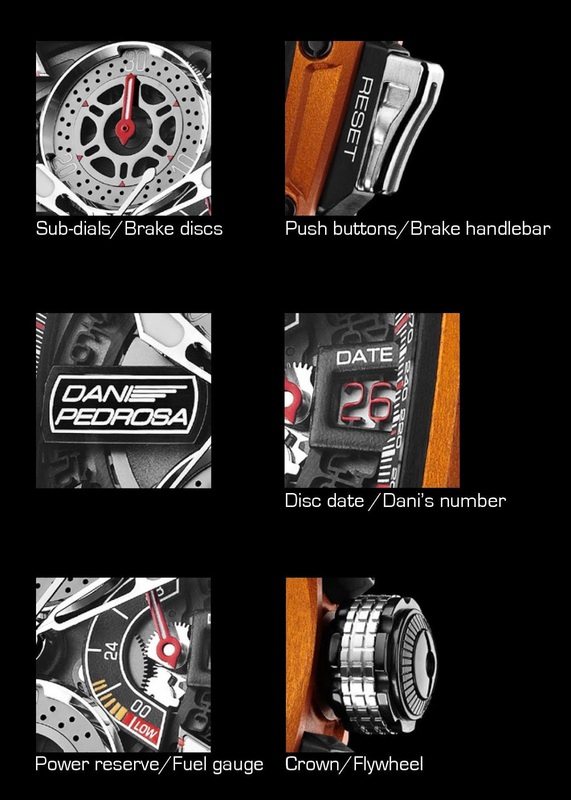 The new Challenge Dani Pedrosa timepiece teams style with sophistication, demonstrating CVSTOS’ watchmaking flair. In addition to the automatic chronograph movement, which is assembled and decorated in CVSTOS’ Geneva-based atelier, the timepiece features a jeweled oscillating weight, which is a full sphere, designed in the style of a spiked wheel rim. This rotor employs CVTSOS’ own tungsten 88-titanium technology and is laser-etched with the serial number of each model. 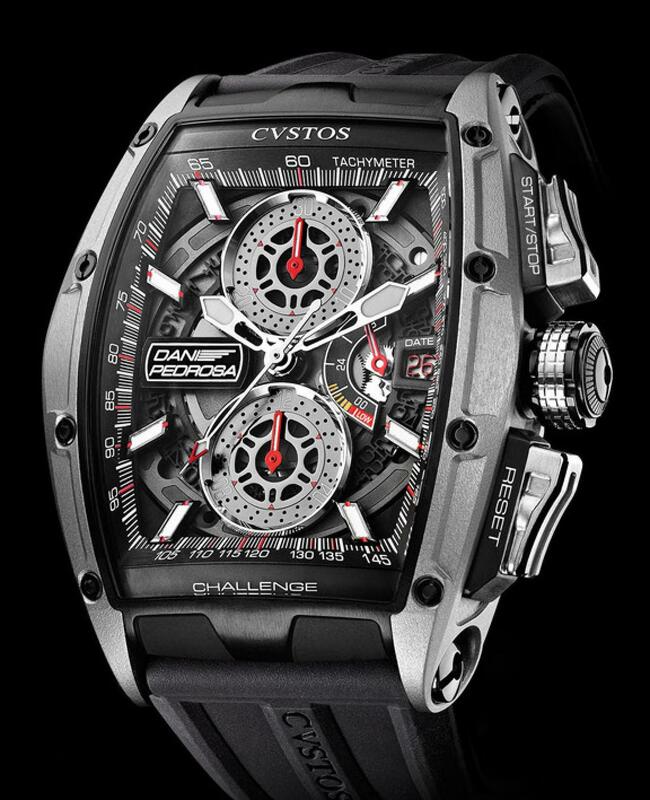 This new timepiece is born from a natural friendship and mutual respect between CVSTOS founders and the racing star. This latest offering from the Swiss watchmaker marries the excitement and skill of sport with horological precision and craftsmanship. Dani provided CVSTOS a great start to the new collaboration by winning the Spanish Moto GP just days after sealing their alliance. Each serial number engraved on the oscillating wheel.